Toolboxit is a new London-based start-up with big ambitions. During substantial and successful careers in the construction industry, founders Yvonne Edwards and Steven Plummer identified a need to modernise the way on-site health and safety checks and communication are managed. Their vision was to digitally transform ‘Toolbox Talks’ – short, informal safety meetings given to site workers on building projects. In a construction context, these are conducted on the building site daily or weekly. Traditionally they involve a protracted manual process – printing forms which are signed by site workers and scanned back into office systems as a record of health and safety compliance. 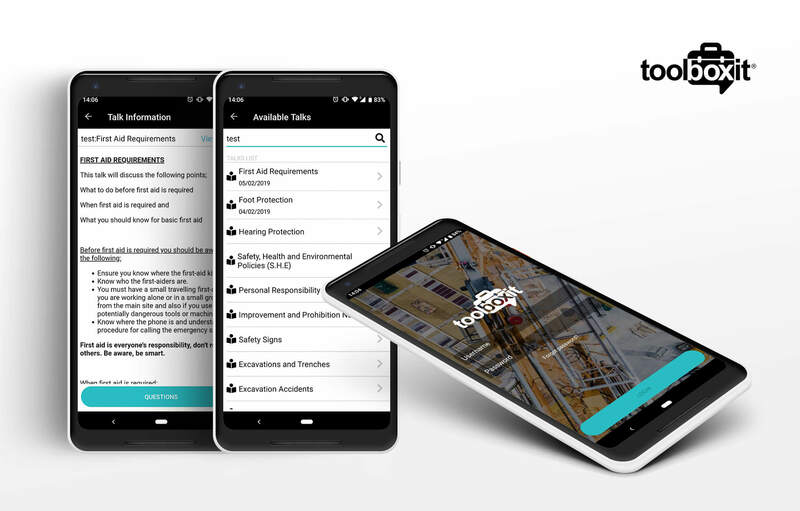 For greater efficiency, and to enable the whole process to be initiated and completed on site, Yvonne and Steven wanted to devise a modern mobile app for use on site. The first task was to find a software development partner to translate the founders’ ideas into a viable application. After extensive internet research, they identified four companies to interview, which they narrowed to DCSL Software and a small development company in the north of England. DCSL Software’s impressive web site set the company apart and the interview confirmed it had all the relevant experience and resources. After being walked through the existing Toolbox Talk process, DCSL Software’s MD Nick Thompson drew up a proposal for a digital alternative. “We liked what he had to say,” Yvonne says. We weren’t just thinking of the immediate opportunity, in UK construction health and safety. We wanted the option of taking the app to Canada, Australia and the US, and to other industries that use Toolbox Talks. So we needed a partner that could take us on that journey. Read more. Working closely with Yvonne and Steven, DCSL Software designed and built the Toolboxit solution, basing it on Microsoft’s Azure cloud platform. 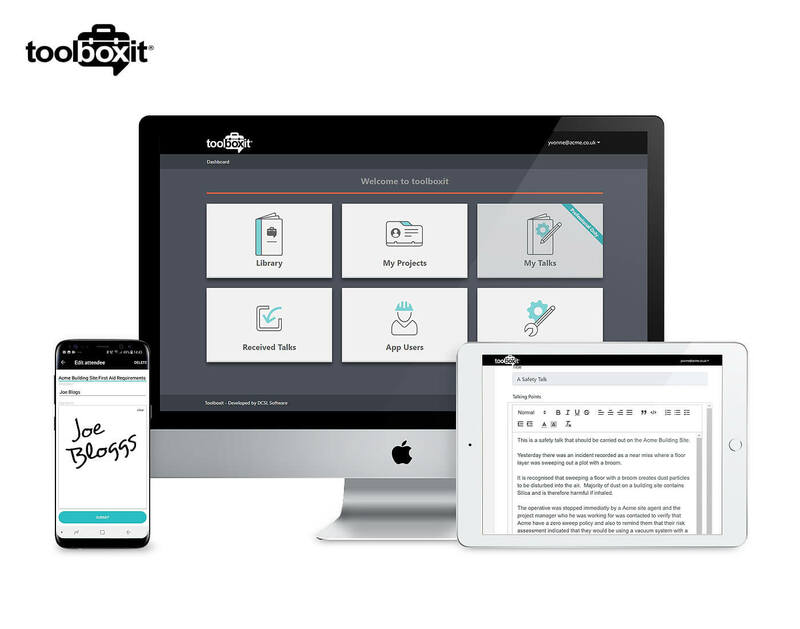 There is a front-end web portal for document sharing, and a mobile app for Toolboxit clients which is accessible on both iOS and Android devices. Clients that take out a professional subscription can use the portal to write their own Talks, and distribute them to any number of recipients for local delivery. If the recipient is an existing Toolboxit user, the content automatically comes up as a priority in their mobile app; if not, they receive it by email. “This feature is quite unique,” Yvonne says. The solution is based on Azure SQL Database, a state-of-the-art relational database-as-a-service (DBaaS) which harnesses the latest Microsoft SQL Server Database Engine. This ensures rapid performance and easy scalability, which will serve Toolboxit well as the business grows. And because the software is cloud hosted and easy to access remotely, records can be looked up on site. The solution is fully encrypted and GDPR compliant, containing any risk to data privacy. Although subscription payments (the charging model for the app) will be handled by a third-party provider, Toolboxit needed to be sure its cloud-based and mobile software met the latest regulatory requirements, something DCSL Software was able to advise on and build into the platform. Alfredo has been a diamond. He has been fantastically responsive. Read more. The market reception to the new app has been enthusiastic. “Health and safety is a subject that makes people’s eyes roll, and nowhere more so than construction, where teams are under great pressure to get work completed but where failing to exercise due diligence could result in a serious accident. So to have a solution like this is transformative,” Yvonne says. Being a cloud-based app, it’s very accessible and affordable. It works out far less than the price of a daily cup of coffee; in fact, if you buy a daily cup of coffee for a week, that’s the equivalent of our monthly subscription. Read more. In addition to international opportunities, Toolboxit’s founders have identified several other market sectors it could target beyond construction, such as fleet management and the automotive industry, where health and safety talks are vital, but where handy digital solutions are lacking. They’ve been with us since the product’s inception and know the app inside out, so we’re keen to maintain our strategic partnership. Read more. Keeping DCSL Software close at hand will be crucial for continuity, as it adapts and rebrands the app for each new market. “They’ve been with us since the product’s inception and know the app inside out, so we’re keen to maintain our strategic partnership,” she adds. Willis Towers Watson Networks is one of the world’s largest and most progressive insurance intermediaries. It offers regional insurance brokers the opportunity to retain their independence, yet tap into an impressive network of strategic relationships, resources and capabilities including state-of-the-art IT systems and support. Its broker members typically provide policies ranging from employee liability to fleet insurance to business customers.